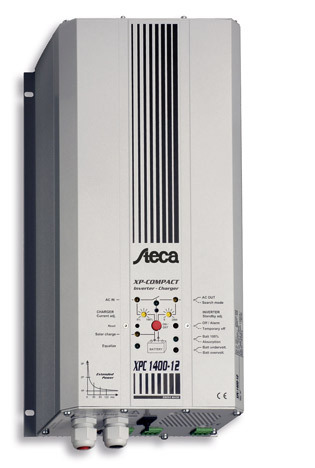 The Steca XPC series of inverters combine a very high overload capacity with the capability to operate highly critical loads. Other important features of these high-quality inverters are their powerful device protection and their low own consumption. The Steca XPCs combine a sine wave inverter, four-stage battery charger and transfer system in one device, therefore making them also suitable for hybrid systems. The built-in multifunctional contact enables you, for example, to switch on and off diversion loads for excess power or start a diesel generator to recharge batteries.